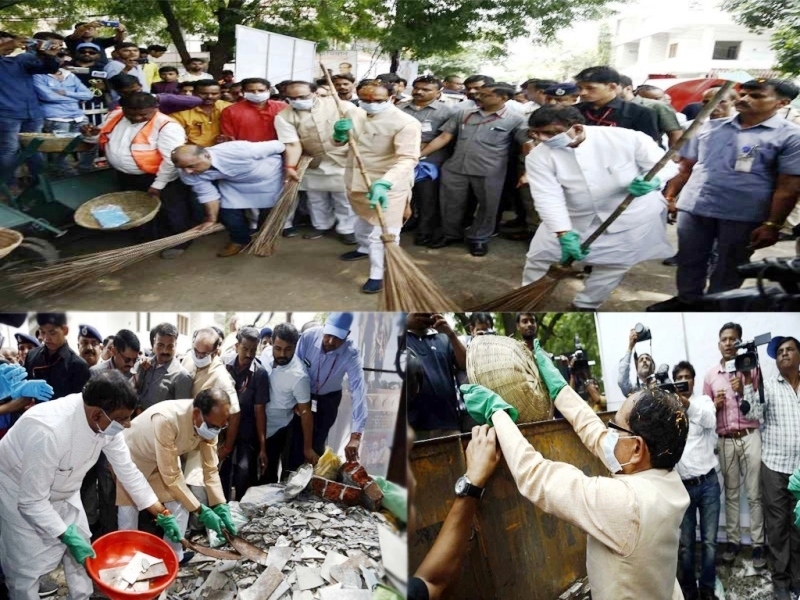 Bhopal: The first day of the country-wide “Swachhata hi Seva” campaign initiated by the Prime Minister Shri Narendra Modi was started off by Chief Minister Shivraj Singh Chouhan by cleaning Ramanand Colony here. The campaign will conclude on October 2 on the birth anniversary of Mahatma Gandhi. Renowned personalities of the society will take part in the ‘Swachhata hi Seva’ campaign. Starting the campaign CM Chouhan said that Madhya Pradesh will become the champion of cleanliness in the country. He said that this goal can be met only with the support of the people. He said that he will begin his day with cleanliness work every day till the campaign concludes on October 2. He said that to make the cleanliness campaign successful, participation of each citizen of the state along with the government’s efforts is must. The Chief Minister administered the oath to the citizens to take out time and join the cleanliness campaign, get involved in cleaning their localities; workplace, hospitals, schools and roads besides devote at least 100 hours in a year to cleanliness. He said that taking one step towards cleanliness is the beginning of a healthier Bhopal. He said that Indore tops the list in cleanliness and Bhopal is second. This was possible only with the support of the public. The Chief Minister has also called upon people to take Bhopal to the first position in the Cleanliness Survey -2019.